It is Wheelhouse's 8th Anniversary (can you believe it?!?!?!?). So in honor of eight great years of bringing bike sales, service, rentals and tours to the Detroit Riverfront, Kelli put together a list of her eight favorite city rides. Get out there and enjoy this fabulous weather and our fascinating city. And, Happy Birthday to Us! Grand River. From Downtown all the way out to Brightmoor and Old Redford. Sites along the way include the Albert Kahn-designed Cadillac Building and the Grande Ballroom. Head south on Oakman for go-cart racing at Doll's. Just west of the Southfield Freeway, the lovely neighborhoods of Rosedale Park and North Rosedale are worth some meandering. Del Ray/Woodmere/Southwest. Head west on W. Jefferson past Livernois to explore the supremely fascinating neighborhood of Del Ray. Plan your visit on a Saturday or Sunday so you can swing through Fort Wayne. Head up Dearborn Street where, at Fort Street, you can enter the gently rolling Woodmere Cemetery. Notable graves include James Vernor, Detroit soda superstar, and Eddie Slovick, the last U.S. soldier to be executed for desertion. Jump onto Vernor to hit up a taco truck. Creekside/Conner Creek Greenway/Mt. Olivet. The Eastside is a great place to ride. Hit up the tony Villages on the way out to the Jefferson/Chalmers area and scope out marinas, canals, and the Fisher Mansion. Then head up St. Jean and Conner all the way to 8 Mile, with City Airport and Mt. Olivet Cemetery as scenic points along the way. Rest Stop at Two-Way Inn, pay a visit to the Dorais Velodrome and turn-around at the charming Milbank Trail, just south of the border. Hamtramck. So. Many. Bars. Plus the Power House, Juxtapoz houses, Ride It Skate Park, Hamtramck Disneyland, Veteran's Park and Hamtramck Stadium. All this and good food make Hamtramck a dream destination. Dequindre Cut/Riverwalk. This might be a "duh" entry, but riding along the Detroit River and up The Cut never gets old. Belle Isle. Yep, another "duh," but it's just a great place to ride (Penske Infrastructure [TM] notwithstanding). Heading out to the Lighthouse for a most-excellent view of Lake St. Clair is always a pleasure, and stops at the Aquarium, Beach, Conservatory and Dossin Museum are great bonuses. Rouge Park/Hines Drive. Head west on Warren to reach Rouge Park which, being even larger than Belle Isle, is worth spending some time exploring. Feeling ambitious? Keep heading west to hit up Hines Drive, a 17-mile parkway that'll take you all the way to Northville. Bonus: 6 miles are closed to vehicular traffic on Saturdays. Palmer Park and surrounding neighborhoods. Kelli's a University of Detroit Mercy grad and lived in the University District in the 90's, so she is definitely biased, but riding through the woods in Palmer Park is inarguably an amazing experience. The neighborhoods in this sector of NW Detroit are spectacular: the afore-mentioned University, Green Acres, Palmer Woods and Sherwood Forest. Plus you can pop over to Dutch Girl Donuts for sustenance. Oh - Marygrove College is not that far and is simply stunning. People for Palmer Park has a group ride every Thursday evening led by the inimitable Henry Ford ii (Wheelhouse's Belle Isle tour guide!) if you're interested in an insider-led ride in the area. Speaking of tours, check our tour schedule and let us guide you on your next ride through the city. We can also hook you up with a bike if you need a set of wheels. 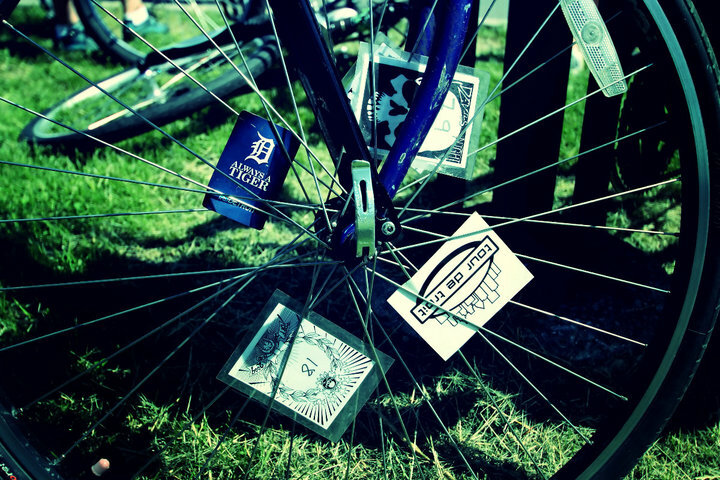 However you ride, come join us and explore Detroit on a bike!